Fighting the BNP and EDL: we need working-class politics! Yarls Wood solidarity: close all detention centres! "UNISON four": stop this witch-hunt! Sussex University: defend the six, support the strike! Royal Mail: reject this shoddy deal! PCS severance dispute: all out on Budget Day, the same deal for all! Debate: anti-semitism and the split in the Irish Workers' Group. To stop cuts, seize control of the banks! "What-ism" in the 21st century? Iraq: now fight for a labour law! Agitation and accommodation: the union "organising agenda"
The British Airways cabin crew dispute is hugely important. BA boss Willie Walsh’s attempts to deregulate, de-skill and casualise the BA workforce will not be an isolated attack — it will be part of a widespread, generalised offensive by bosses to break the backs of well-unionised workforces that have won stable pay and conditions. None of us knows which industry, which workplaces, will be next. 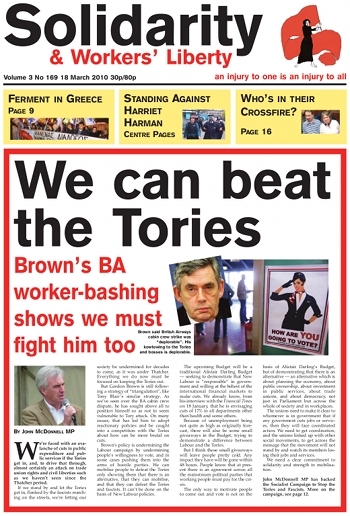 The fight now is in BA; it is our duty to support those workers. Their fight is our fight. “I knew it was possible, but I didn’t think it could actually happen”. How many of us had these thoughts rattling around our heads in the aftermath of Nick Griffin’s election to the European Parliament? 6 May 2010 could inspire the mass resurrection of such sentiments. Yet in the face of abundant and very clear “messages” of the political dangers we face mainstream anti-fascism appears consistently myopic and complacent. Counterfire was launched on International Women’s Day. Throughout the website a lot of work has been done to assure the appearance of gender equality and to foreground the women’s struggle. Photographs of picket lines, for example, carefully show as many or more female workers than male ones. This sounds like PR nonsense but it is important: to develop as a socialist feminist entity in action as well as name, Counterfire, like all of us, must guard against the possibility of misinterpretation. The English Defence League’s decision to call a central London rally during working hours on a weekday, and their ability to successfully mobilise for it, is an alarming indication of their growing strength and confidence. Showing solidarity with the visit to Britain of far-right Dutch politician Geert Wilders, estimates of the EDL’s numbers ranged from a few hundred up to 1,000. YouTube footage of the EDL’s main march shows a sizeable EDL presence that outnumbered the 250-or-so anti-fascists mobilised to oppose them. Following its failure to organise protests in Glasgow (in November last year) and Edinburgh (in February this year) the Scottish Defence League (SDL) announced that it would be holding a “respectful vigil” in Lockerbie on 27 March. The SDL’s decision to opt for a “vigil” in Lockerbie was a confession of weakness: lacking the confidence to try to organise an event in an urban centre, it chose instead to try to stage a stunt in a town of just over 4,000 inhabitants in the Scottish Borders. At this year’s Oscars Kathryn Bigelow became the first female director to be given a gong — for her film Hurt Locker. It was a worthy winner in a crop of “Iraq war flicks”, but it is not political film. Jill Mountford, who is standing as a Workers’ Liberty candidate in Peckham and Camberwell, spoke to Solidarity about the politics behind her campaign. What do you think of what is on offer politically from the mainstream parties in this election? In policy terms there is very little for the working class — we have three main political parties, if you include the Lib Dems, all vying for the centre ground. But the working class is not in the centre ground, we’re firmly on one side of the class divide. David Henry is standing in Salford in the general election. He was selected as a “community candidate” by the “Hazel [Blears] Must Go” campaign, but is now standing under the banner of the Trade Unionist and Socialist Coalition. He spoke to Solidarity. How did you become a TUSC candidate? The “Hazel Must Go” campaign was founded before TUSC was even conceived, by a diverse group of people who aren’t particularly party political, and they remain dominant in the campaign. More than five months since it began, a strike movement in France of thousands of undocumented migrant workers is continuing. Concentrated in the Paris region and outlying suburbs and strongest in the construction, restaurants and cleaning sectors, around 8,000 “sans papiers” workers have been striking and occupying workplaces, demanding a change in immigration law to grant rights and papers to all undocumented migrant workers in France. The strength that the sans-papiers workers have acquired through their strike has surprised the bosses and put them on the back foot.